Have you Broken New Years Resolutions yet? I know, it is only the twentieth (20) of February, but who’s counting? It is way too soon for you to give up! Am I right or wrong? Your resolutions are still too fresh in your mind to quit this early. So this year, you will succeed. Don’t you want to achieve your goal? Whether it is a financial, personal, or a business goal, maybe, I can help. Recently, I saw an article on Philly.com called You broke a New Year’s resolution…now what? It happens every year, so this is nothing new! 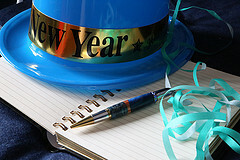 Many people make the same resolutions every year and break them. Why bother making the resolution, if you will break them? I think all of us start out with good intentions, but do not make the effort to succeed. New Year’s Resolutions range from losing weight to quitting smoking or drinking. I always wonder why people wait for a certain date to establish a goal. If you really wanted to quit smoking or drinking, you could get some help or enter a program to quit. Does saying it on New Year’s Eve change anything? I don’t think so. What does it take to achieve these goals? I learned a long time ago, I could do anything I wanted to do! Yes, my self esteem is high and it comes from years of achieving results. Whenever I set a goal, I work backwards to determine what I need to do to reach my goal. Another way of explaining this is to break down your goal into daily tasks. Why daily tasks? You want to work on your goals every day. Working on your goals is not a part time job! So you took that resolution of losing 50 lbs. and broke it down to one pound a week. You could probably cut out daily desserts or candy bars and reach your goal. Wouldn’t that be boring? When you make it too difficult or change too much, you will break your resolution. Any extreme diet or change will definitely fail. Diet alone will not be enough to succeed. You must increase your activity to compensate for years of inactivity and bad habits. There is another reason for exercise, it compensates for our mistakes. To recap, you are eating less and exercising more. You are on your way, but there is one more element you need to incorporate. You have to monitor your progress! With weight loss, weighing yourself everyday is a good way to monitor your progress. The scale is an honest assessment of your progress. So you weigh yourself and you didn’t lose anything. What do you do? Perhaps, nothing or increase your effort! Every week you have to determine if you achieved your goal. This is not easy because many people want to lose weight, but very few achieve it and even fewer keep it off. Aren’t you tired of saying the same New Year’s Resolutions every year and breaking the same one too! Make this year the one where you succeed. I started a series on success a couple of years ago which details these elements. Have you Broken New Years Resolutions yet? Many times people who break their resolutions figure that since they’ve broken it, they’re pretty much done and they end up forgetting all about it. In reality, there’s no reason to jump back up and try again. I had a friend who quit smoking over and over again. She finally did it, but only after 5 years of trying over and over again. Resolutions are always treated differently from ordinary goals. I think that is one of the problems of resolutions. It gets you off the hook that you tried, but failed. It is one of the reasons I avoid resolutions other than my public statement on my blog.